El Corona is a district slightly to the south-east of the city centre of Los Santos. El Corona is the main strong hold for the Varrios Los Aztecas gang, and there are five known residents, Cesar Vialpando, Gal, Hazer, Sunny and Kendl Johnson (who moves to El Corona to live with Cesar Vialpando). El Corona can be described as a working-class, poor and gang-ridden district, as evidenced by the gang presence, some stores and the numerous houses in the district. The majority of the areas social problems primarily stems from the gang activity and gang violence. El Corona is modeled after El Sereno. Surrounding El Corona are the districts of Little Mexico, Verdant Bluffs, Idlewood and Willowfield. Also nearby is the Los Santos International Airport. El Corona is a strong hold for the Varrios Los Aztecas and the home of Cesar Vialpando, and has (prior to the events of Grand Theft Auto: San Andreas) been attacked by the Los Santos Vagos. Carl Johnson is first introduced to El Corona (in a mission) during the High Stakes, Low Rider mission, where Carl meets Cesar at his home. El Corona, after Cesar Vialpando leaves Los Santos, falls into the control of the Los Santos Vagos. Upon his return, Cesar begins to kill Vagos gang members in El Corona, and eventually asks Carl Johnson for help. Carl, Cesar, Gal, Hazer and Sunny kill many Vagos gang members, and win the district back for the Varrios Los Aztecas. 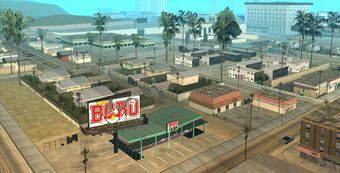 The area, already rioting following the acquittal of Frank Tenpenny, continues to riot until Tenpenny's death, at which time order is restored to El Corona and Los Santos. 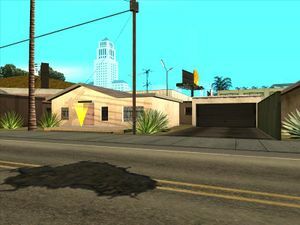 Carl Johnson's home in El Corona, as depicted in GTA San Andreas. This page was last modified on 9 April 2013, at 14:59.